Have your kids play the classic "Telephone Game" and teach them about communication. Here is another game to teach or review the books of the Bible. 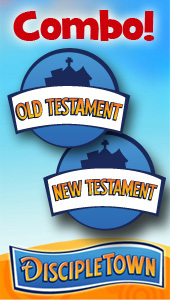 Here is a fun game that will help children learn and review which books are in which testament. Candy, rewards and a "cheat" to get the point across add to the excitement of this game! The Friend Factor Game Show! Really Fun Game for Children's Church! A "game show" style game, that would go along great with a teaching on friendship. For this important teaching lesson you will need Legos, Bell or Hanky on tall square table center stage for team competition. Similar to musical chairs - call it musical hats if you want! The child who is 'hatless' is removed, and the game begins again, but with one less hat. You will need lots and lots of balls, or wads of paper, 7 children, as you teach about serving others. A fun game show gone amuck helps teach kids the meaning of worship! Exciting relay that gets all the kids involved as they work as a team to pass the water. Grab a box of Cheerios and get ready for a few rounds of fun at your next Children's Ministry event. This "Cup Stacking" game requires a table, stop watch, calculator, and a bunch of cups. Trapped in a Cup Tower! Get ready to stack some cups in huge towers, as the kids use creativity to construct walls! Everyone knows Rock, Paper, Scissors - this large group version is a LOT of fun and teaches teamwork, encouragement and the power of prayer! Interactive lesson with a powerful teaching twist for upper elementary kids! Follow these instructions carefully and you will have a lesson filled with fun and laughter that ends with a somber challenge both for salvation and a surrendered life for kids already saved! Life takes some guessing, and even if we are not sinning, we have to make choices. We should learn from watching the choices that others have made before us, both good and bad) and realize that others are watching us! The object of the game is to write a verse in mirror image on a poster board. You will need 2 small mirrors and 1 large mirror. This opening lesson activity helps to illustrate that while we have many things that make us different... there are some things we can all agree on. Have your kids race with this fun relay as they transfer water. This is a pretty simple review game show. (You can also just use Bible trivia questions. )You will need Spinning Wheel -wood or poster board. The Bible says that everyone needs to be saved - only most people do not realize it. They think they are "fine," just like the man reading the book- he needs to look down and realize it isn't just a windy day. People need to see the things in this world that show that there is more to it, and that they are indeed in need of being saved. This is "Win, Lose or Draw" without the paper or pens! Instead, have a supply of rope licorice on hand! Relay fun using Winter Gear (giant winter coats, gloves, knit hats, scarves, etc.). Could be adapted for other seasons or use Biblical costumes. You need 12 cards. The idea is to find the 3 gifts that the Wismen brought to Jesus by remembering which cards they are on. World War Paper Rock Scissors! Have your kids play this fun game as you take Paper-Rock-Scissors to the next level! Each kid who answered review questions takes a turn sitting on the stool with a straight face while the leaders try to make him/her laugh. This is a game that can be used for when you teach on Jesus healing a blind man, OR about the Holy Spirit and how He helps us. This is a fun unscrambling game using 20 random books of the Bible. Instructions for making a TP Bazooka from Roger Fields of KidzBlitz! Here is a trivia game for your children's ministry on Mother's Day! Here is a fun Preschool Bible activity to help preschoolers learn that life has its ups and downs, but God is in control and works for the good of those who love Him, according to His purposes! Non-competitive games to help teach your kids about unity. Now, thanks to the power of dollar stores you can find glow sticks, bracelets, necklaces and the like really cheap. Use them in these 5 creative ways to add fun.. and GLOW to your Kids Ministry! There are lots of effective teaching tools you can use to reach kids, and there are good reasons to use all of them at one time or another. However, one stands out above the rest: games! To help with the idea of doing while learning, here are 8 kid-tested and teacher-approved games to help your students learn the books of the Bible. This is a good ice breaker or introduction to class. You can use this game when talking about Adam naming the animals. If you asign two of every animal name, you can talk about Noah and the Ark.